If you're looking for a low price on some of the top PC cans, these cheap gaming headset deals will help you save. It's easy to write off a good headset deal, but when the cheap gaming headset deals come running, you better chase 'em down. It's not often the best gaming headset goes on sale. However, when it does happen, you can count on our devoted team of hardware aficionados to track them down and post them here on this very page. As audiophiles ourselves, you'd be right to assume we've tested our fair share of headsets, gaming or otherwise. We know the deal. You want the best sound quality, comfort and functionality you can afford at a given budget. Maybe you want something wireless, maybe not. Maybe you need active noise cancelling (though, if that's the case, do yourself a favor and shell out for the Sony WH1000XM3's—we can't recommend them enough!). Perhaps what you desire, above all else, is a decent and discreet mic designed to eliminate background noise. In that case, we can vouch for the SteelSeries Arctis Pro, and luckily, it's available at a discounted price right now. Of course, if you're looking for something that's either slightly better than TV speakers or those built into your monitor, there are also a handful of pretty good headsets that are simply cheap to start with. The joy of finding a cheap gaming headset deal is that you can get a decent quality audio device for the same price as a budget one, and that's the real sweet spot. You can even find wireless gaming headsets now for well under $100 if you know where to look. Here are the cheapest gaming headset deals we can find this week, with big savings up top and budget headphones below. If you want the absolute best gaming headset for PC, this is it. 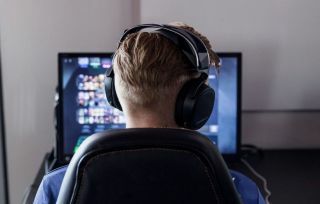 What really makes the difference is that broad 5Hz-40KHz response range, which means that not only do you get a great, broad sound when gaming, but the headset will also cope with everyday use. This means you can take it with you while listening to audio on your phone, and you can watch movies and TV without getting that echo-y 'empty' sound that some gaming headsets produce. The drivers aren't the biggest, but the response range means they perform efficiently. The GameDAC is a boon for PC users, especially, because it acts as a control center and it takes away any processing, leaving your PC to focus on running the actual games. It's neat and tidy, and fits perfectly into the rest of your set-up. The neat RGB lighting, which is subtly implemented, is the finishing touch. The only real drawback is that the headset doesn't feel as weighty and premium as some of its rivals. Overall, it's a great pair of cans that punches well above its weight, even if the price is quite high to start. This is a good, solid gaming headset at a great price. HyperX's Alpha model has some very punchy 50mm drivers in each headphone, so can deliver forceful sound. However, it also does so with reasonable finesse, thanks to a decent response range and a dual-chamber design, so you rarely feel like one sound type is more dominant than the other. With budget gaming headsets you often get overwhelmed by bass, but the Alpha manages a good range without charging a premium price. It's a chunky, comfortable design too, like you get with most HyperX cans. This means that it feels solid, so you can be a little rough with them and not worry about breakage. The only exception is the in-line controller, which feels relatively cheap compared to the rest of the headset. However, for the price, this is a great buy. So, you want a wireless headset at a price that won't blow your mind clean off? This is the one to go for. If offers the same sound quality as mid-range wired headsets, and while it isn't quite as accomplished as the Arctis Pro, it does offer 20 hours of wireless use on a single charge, which is a phenomenal achievement. What's more, that sound quality is (for the most part) perfect, with none of the break-up and artifcating that can potentially hamper other wireless cans. It's damn comfortable too, with the Arctis' rather unusual headband feel, and it isn't that weighty so you don't feel like you've got a large lump of plastic on your head. Plus, there's an added convenience factor with the fact you can still use the headset while you're charging it, a feature sadly lacking from many rivals. If you can forgive the mic, which doesn't perform as well as the one in regular wired models, then this is a real winner.